February 2016 saw a face-lifted Captiva launched, with mild body and interior changes. The Captiva comes across as one of those quiet achievers – it doesn’t make lots of noise in the market like the CX5, Santa Fe et al, but you see a lot of them on the road. That’s not saying it’s a runaway sales success. We’ve mentioned it many times – this market segment is packed with choices. Sure, SUVs are now outselling cars, but manufacturers can’t get complacent and just hope that by having their brand name attached will equate to great sales. 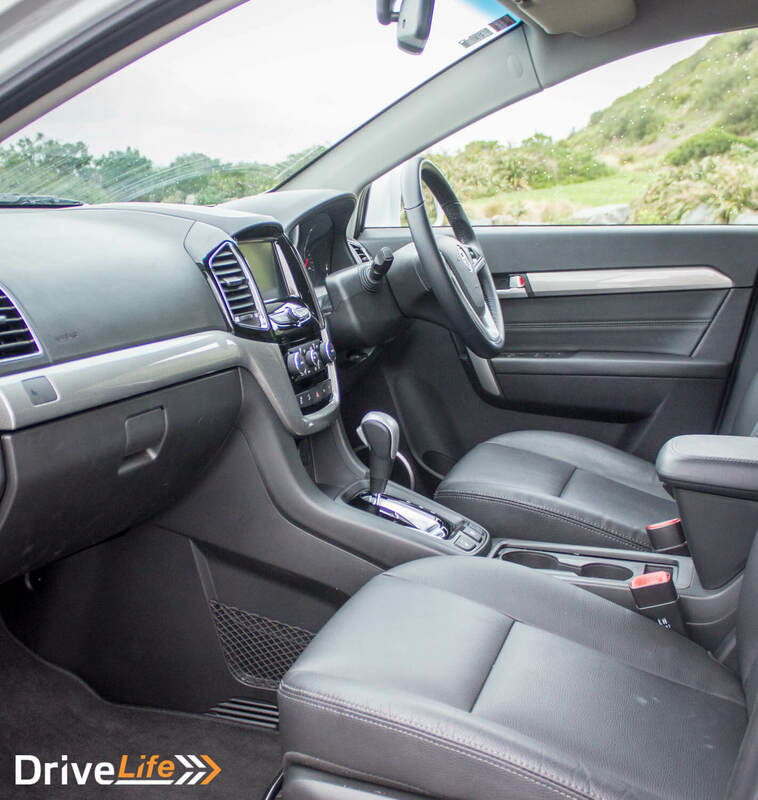 Holden New Zealand sent us an AWD LTZ diesel to review. The range starts with the 2WD $38,490 5-seater LS model with a 2.4-litre petrol engine (with 7-seats and diesel optional), to the LT with either a 2WD 3.0 V6 petrol engine or the AWD 2.2 common rail diesel turbo ($51,990), then to the top-of-the-range LTZ with the same 2WD petrol ($54,990) or AWD diesel configuration ($56,990). 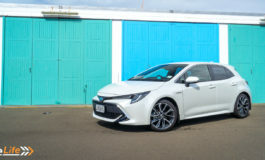 All models have your usual safety features of ESC, EBD and TCS as well as 6 airbags, 5-star ANCAP rating, electric park brake, rear parking assist, LED DRLs, Apple Car Play and Android Auto, Siri Eyes Free, reversing camera, heated mirrors, self-levelling suspension, Holden’s MyLink infotainment system with a 7” colour touchscreen, auto-dipping rear-view mirror, leather steering wheel, auto headlights and cruise control. The LT model adds a Descent Control System, 18” wheels (over the standard 17”), roof rails, Phone Projection capability (more on this later), a trip computer, dual zone AC, and keyless entry and start. The LTZ goes a bit further adding body-coloured sidesteps, 8-speaker audio system, Side Blind Zone Alert, Rear Cross Traffic Alert, leather seating with electric driver’s seat and heated front seats. 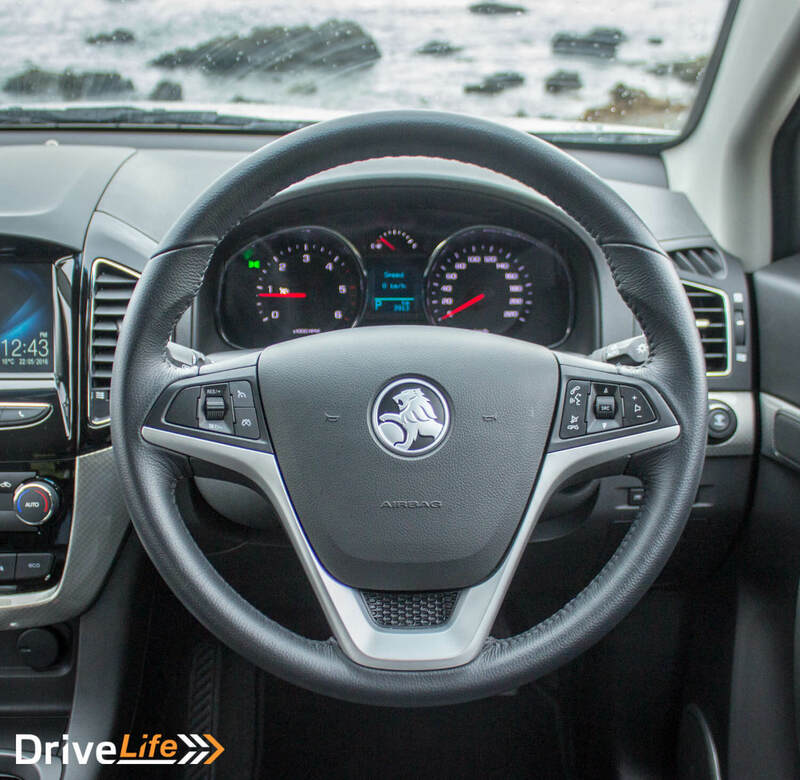 Within the Holden range, the Captiva sits between the Trax and the Colorado. This is one good-looking SUV. There seem to be a few different marques in this size SUV range right now that look very similar – while testing the BMW X1 recently, I thought I saw another one from the rear but it was a Hyundai. The Captiva shines in the ‘looks different but in a good way’ department, and I believe this will certainly help it when it comes to sales. The proportions are just right, and they’ve given the lower front grille the new GM ‘smiling face’ type look, which luckily hasn’t gone too far and entered into the Just Too Weird space (I’m looking at you, Lexus RX450h). The rear of the Captiva is a little more ‘normal’ looking, but still not unattractive. The sidesteps of the LTZ model really help this car to stand out, at least from the side. The body-colour side steps are a little too small to be of much use, but they look quite cool, adding a nice touch of bling. The LTZ comes with 19” rims and they really suit it. In fact, I think the base model’s 17” rims would change the attractiveness of the car quite dramatically. It’s a shame there’s such a huge price difference between them, as I think the LTZ is the model to go for. I was really taken with the look of the Captiva, but others thought it was dated and gave other comments which I won’t repeat here. To each his own, I guess I am basing my thoughts on the fact that so many of the current SUVs from other manufacturers look just so similar. Stepping inside the LTZ gives me mixed feelings. 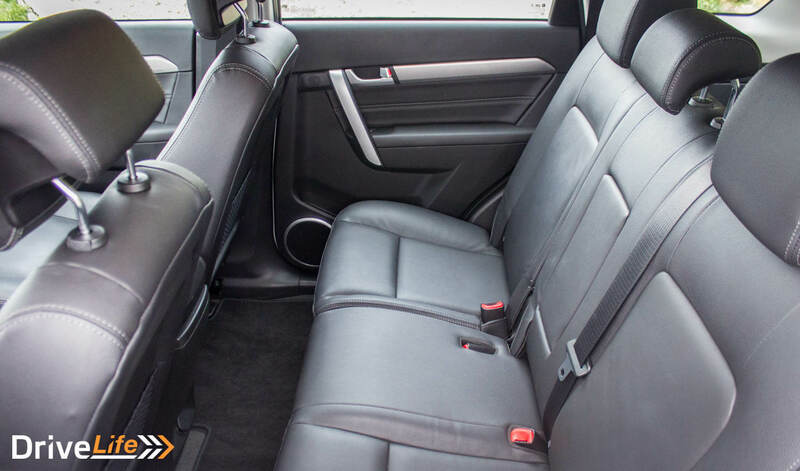 It’s nice – leather seats never make a car look worse. The 7 seats of the LTZ diesel is a market differentiator here, and again this could really help with its sales. There are lots of hard plastics on the inside, surprising for the top spec model, but these are tastefully done and not too obvious. There is ample room inside; rear legroom is excellent, headroom is great, the cargo area abundant in space (if a bit shallow) and there are a number of options for seating/hauling configurations. One of the Captiva’s selling points is that the second and third row of seats fold down flat, as does the front passenger’s seat. I could see this appealing to quite a few people, who want to haul something long – some guy in his 50s with a surfboard, perhaps. There are 7 seating configurations that the Captiva can use to fit your load in. The space behind the 3rd row (when the seats are up is pretty limited at 85 litres, but not as bad as the bigger Toyota Prado, but close. A couple of soft bags might fit in there. In the centre console, there is a large and surprisingly deep bin for storing all your stuff in, and then under the centre armrest there’s another bin which is almost as deep. 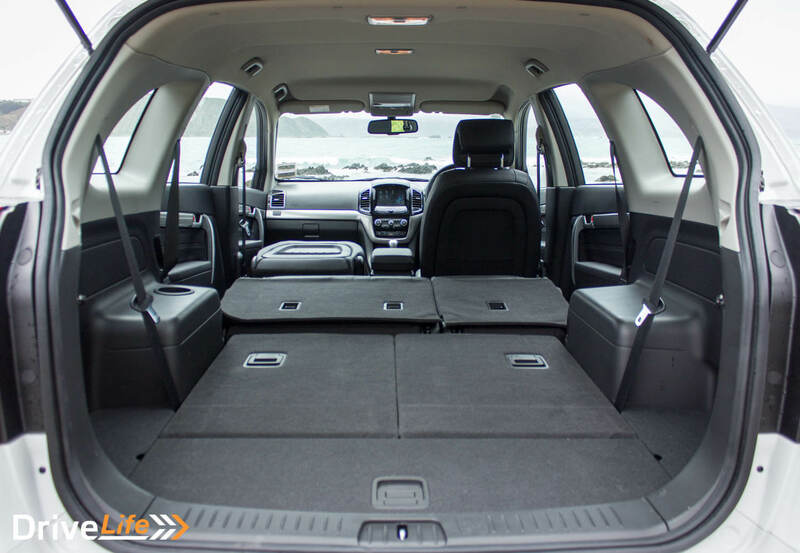 There’s quite a few other storage areas and compartments dotted around the Captiva. However, I did find myself checking the rear of the car had the LTZ badge on it. For the top of the range model, it just doesn’t seem to be as well featured as other models in this segment, for around the same cost. For instance, there’s auto lights but no auto wipers. There’s cruise control but it’s not radar equipped. Only the driver’s seat is powered and there’s no memory function. Sure it’s got heated seats, but they are only single heat setting – there’s no adjustment. 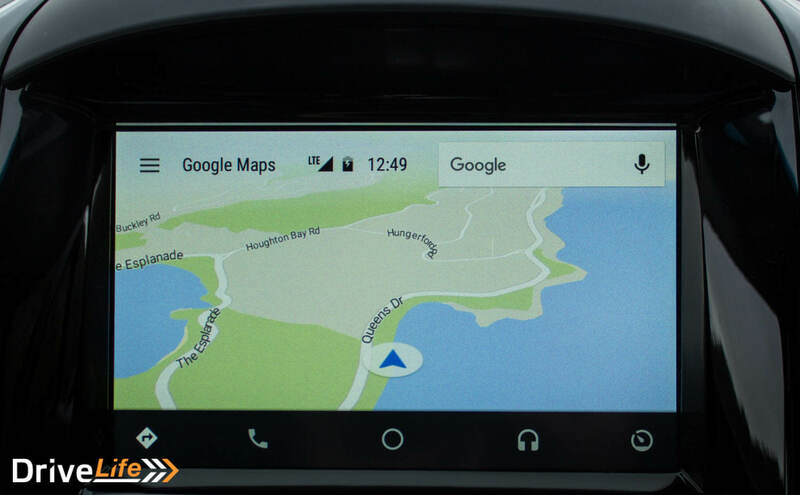 There’s no SatNav – you can hook up your iPhone or Android phone and use it via a USB cable to use its SatNav on the display, which is something at least. There is keyless entry and start, but the keyless start is the old-school one where you still have to turn a key-looking thing to start the car. Just give me a start/stop button, please Mr Holden. Think I’m being picky? 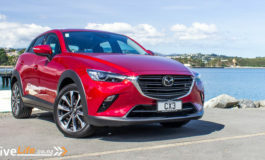 The Mazda CX-5 that Rob recently tested [link] has all of the above and it’s almost the same price (a little cheaper, actually), with the same size diesel pumping out almost the same power and more torque. The CX-5 adds an electric sunroof as well. 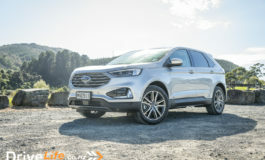 I think if a potential buyer was comparing cars, Holden may (will) struggle here, and this is where I expect people will buy the Captiva, because they’ve always had a Holden. The Captiva is a competent, non-confrontational sort of SUV. Just jump in and drive it. That 138Kw, 400Nm 2.2 diesel is really responsive – it’s quick off the mark, and mid-range acceleration is excellent too. Going on my daily drive to sees a 100km/h uphill run with passing lanes. The Captiva did really well here, and could easily pass slower traffic even though the rise is quite steep. It’s a nice, quiet engine when cruising on the motorway or open road, but compared to some others of the same size, it lets you know it’s a diesel when accelerating or around town. Never really noisy, just that familiar diesel clatter, especially at idle. Other manufacturers outdo the Captiva in this area. The 6-speed auto is a good unit, picking the right ratios at the right times and making the most of the 400Nm of available torque. Claimed combined fuel consumption for the diesel is 8.5 l/100kms. I did 500ks in the Captiva and averaged 10.1 l/100k, with a solid 50/50 split of open road and around town running. The LTZ model is AWD, but you don’t get any sort of assistance in the way of locking diffs, or anything else, other than hill descent control. As you would expect, grip is pretty darn good on all surfaces, with 235/50 tyres fitted. Open road driving is just fine, although you should expect quite a bit of body roll in the corners. The Captiva has four-link independent rear suspension, but keep in mind it’s a tall vehicle. Wind noise on the motorway is well controlled. If you are used to GM cars, you’ll be very familiar with the steering wheel controls, which of course stick with that rotary dial type of arrangement for moving audio tracks up and down or speed up/down for the cruise control, which I don’t like. I’m not sure if it’s a fault, but with the recent Commodore Redline test and then the Captiva, when trying to change a track up or down. I find myself hitting the scroll key and it just doesn’t change the track. I’ll tap it again and again and maybe on the fourth attempt, it will work. Sometimes it just works straight off. Pushing the scroll button up for longer doesn’t seem to help either. I mentioned the heated seats are just on/off. I think the setting for ‘on’ is more medium-well done, than medium-rare – I found myself turning the seat heater off and on, as it’s just too hot left on. In saying that, general seat comfort is excellent. Front or rear, they are just right for short or long trips. Side support in the front is great too, and the manual lumbar adjustment for the driver is welcome. There were some other niggly, annoying things during my time with the Captiva, aside from the heated seats and steering wheel controls. The cruise control doesn’t show what speed you have set it to in the Driver Information Display, between the rev counter and speedo. In a top-spec model, I expected this to be there. No auto wipers is a pain. Perhaps I’ve been spoilt, but even the $35K Vitara I had on test before the Captiva had auto wipers. As mentioned earlier on, there’s no SatNav built in, but the Captiva does come with Apple Car Play and Android Auto capability. Both systems do the same thing – allow you to hook up your iPhone or Android smartphone via a USB cable, and have more functionality on the 7” touchscreen, by tapping the Phone Projection button on the touchscreen. This is a great idea, but I did have issues with it. I have an Android phone, so duly downloaded the app, and then tried to get it to connect. And tried again, and again. The car would just not recognise I had my phone plugged into the USB port. So then I tried the other USB port, and it worked! Great! This gave me Google Maps on the screen, as well as the car reading out my texts, and giving more control over music, and local weather. Using Google Maps on my phone was a breeze, although I didn’t try an iPhone. Interestingly, the owner’s manual shows the car as having built-in SatNav, but it doesn’t seem to exist. The touchscreen was a disappointment also. As it stands, without hooking in your smartphone, it’s just so very basic. It looks like the display of a sub-$30K car to me. There’s no button to bring up and adjust the AC settings or heated seats for example, and the Settings page to change the behaviour of the car was limited at best. You can select Audio, Phone, Phone Projection, Photo Gallery, and settings. The actual usage of the touchscreen is excellent – simple and intuitive, so points to Holden there. So keep in mind if you don’t have a smartphone that’s going to work in the car, you will be missing out on some features. I had another issue with the audio system in the Captiva. It has great sound, don’t get me wrong, but if you use Bluetooth for your music source, when you get back into the car it diverts to radio (as the car hasn’t had time to connect to your phone) and you just get static, as I couldn’t get the car to remember a radio station. I’ve got to admit, this drove me a little crazy. In the end I stuck a USB stick in with some MP3s on it, and it remembered that so problem solved. But still, I had expected a better experience. The trip computer didn’t win me over either, for a number of reasons. Firstly, it’s just so very basic – I kept trying to find more more info, but there is not much there. Average fuel consumption, instant fuel consumption, range to empty and speed. That’s pretty much it. Again, for the top spec model I was expecting so much more. Also, the four buttons to alter the trip computer are off to the right, under the steering wheel on the side of the dash. Other manufacturers do more with their trip computer with less buttons, and the buttons fall much easier to hand. For the Captiva, it’s not something you want to try changing while you are driving. The other thing is the buttons are quite cryptic, so I spent too long trying to work out how to drive the thing, looking for more information. The Owner’s Manual doesn’t show the buttons at all, and when it talks about changing settings, it just says ‘press the button’ – but doesn’t say which one. In the end, I left it displaying the car’s speed on the display, and that was fine. Actually the Owner’s Manual shows a great trip computer using the 7” touchscreen, but the LTZ doesn’t have this. And since the LTZ is the top model, I’m not sure which model, if any, would have this. Note that you can show the coolant temperature on the display, and it even has its own button (one of the four). 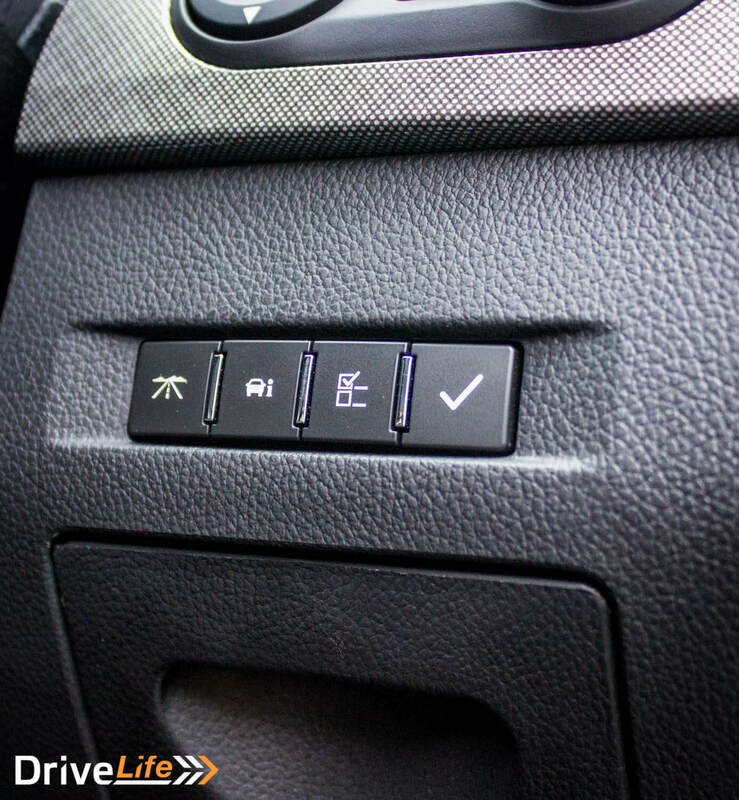 I’m not sure if Holden does any Usability Testing, but I couldn’t work out why they would dedicate a button just to this – making it part of the rest of the display options seems simpler and gets rid of one button. The Captiva comes with an electric park brake, which was welcome. It also has the now-common auto-release function that means if the park brake is on and you accelerate, the brake releases automatically. This is a great idea. But the noise associated when the brake released was not nice. It wasn’t really bad, or sounding like something was wrong, but it was just a little too clunky. Other manufacturer make it almost a surreal experience with auto-release – there is no noise or jerkiness, just accelerate and magically the park brake releases smoothly. Not so with the Captiva. I don’t want to go on complaining about the Captiva – it was a nice car to have for a week. But the little things really stuck with me. The dual-zone AC in the LTZ model worked just great. But (there’s that word again) there’s no constant readout of the temperature you’ve dialled in. 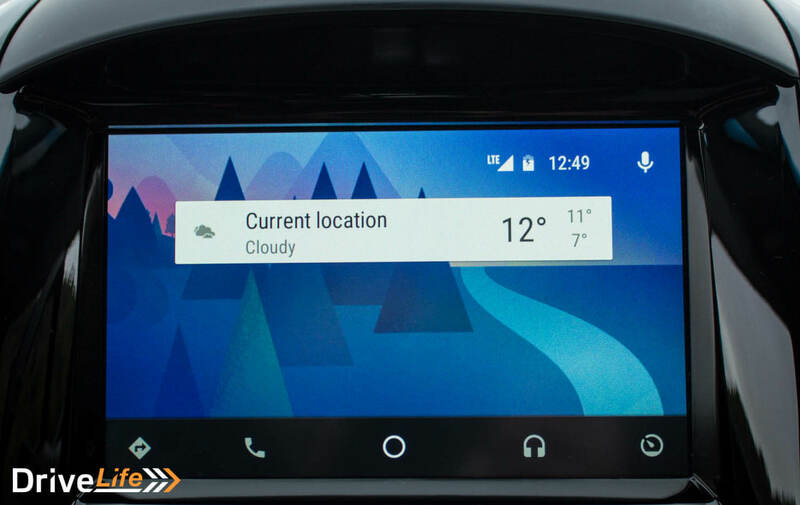 The only way to know what temperature you have set, or what settings you have for modes is to adjust the temperature dial, which will bring up the AC settings at the top of the touchscreen. This in itself is not a huge thing, but I’ve not seen a car like this before and if no one else does it, I wonder why the Captiva does. 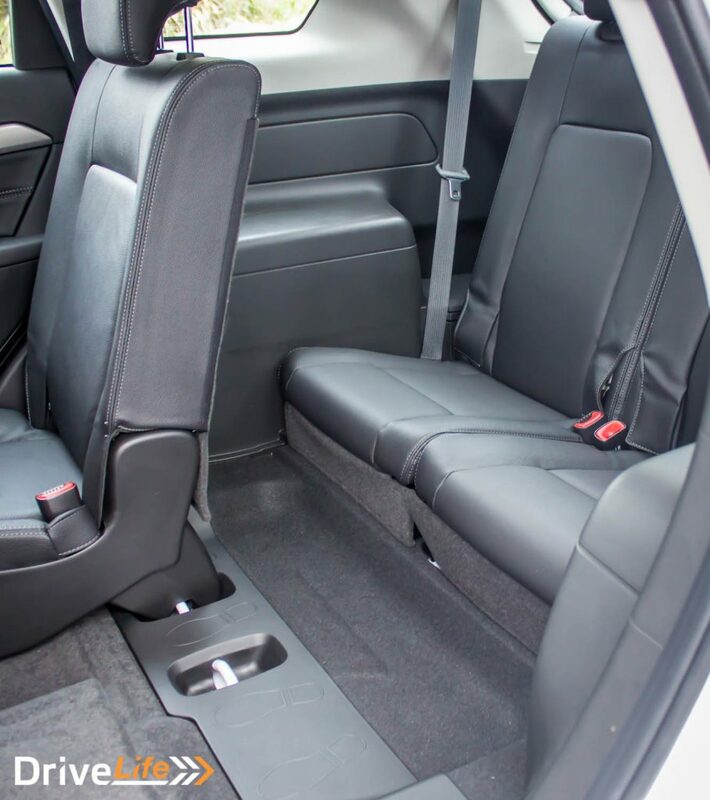 There’s also no AC ducting to the rear roof of the car, for either the second or third row passengers – not even vents in the centre console for the second row. You can see why I kept checking it was the top-of-the-range-model. I did get mostly favourable comments about the legroom in the 3rd row though – it’s not somewhere where a 6-footer would want to spent too long, but overall it’s more than adequate. 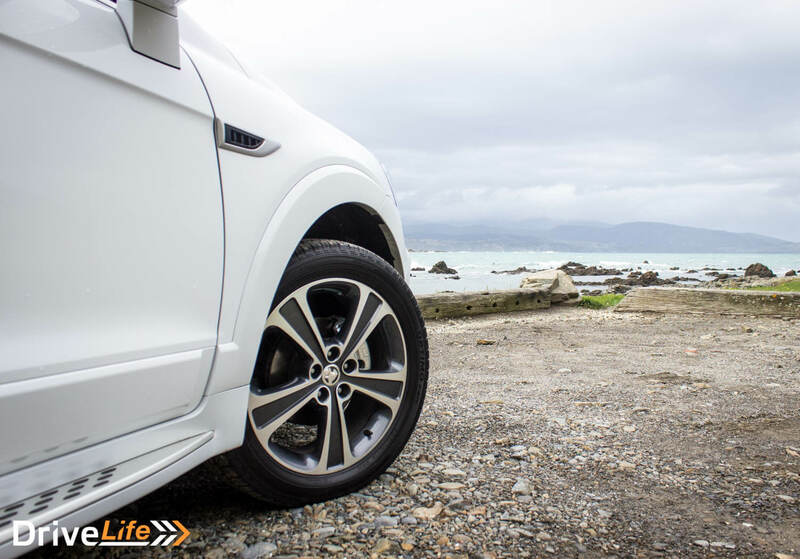 As mentioned, the Captiva is a competent 7-seater SUV that is a viable option if that’s what you are looking for. But I think it may struggle to win buyers when they start comparing equipment levels. I feel a little hypocritical as we’ve said in the past that it’s the drivetrain that makes the car, and not the other features it has. The thing with the Captiva is that this is the LTZ model we are testing – it’s the top of the range, but just doesn’t fit that badge. 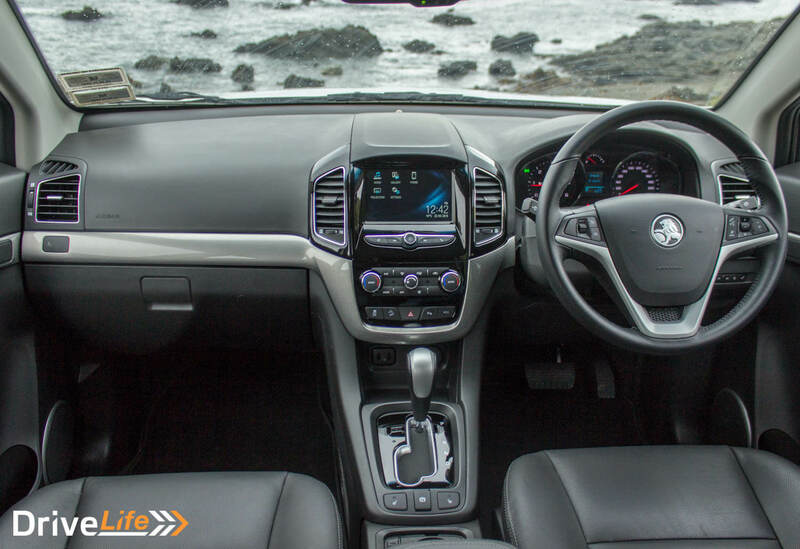 The Holden name will automatically bring buyers with the last generation Captiva and the 7 seats will certainly help too, as will the looks of the car. For me though, there was just too many things I didn’t like about the Captiva to win me over. 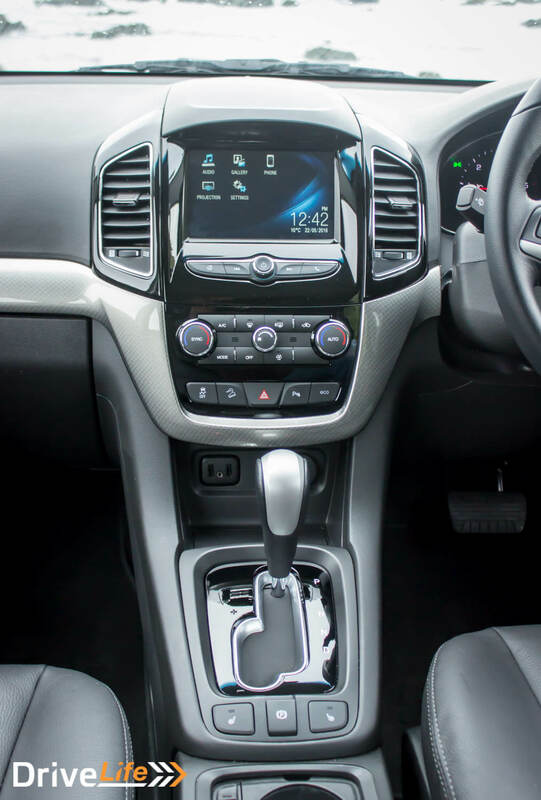 You can read more about the Captiva on Holden New Zealand’s website. Great review thanks, looking at the LS model right now, good price 32,990 fieldays special , this is helpful. Great stuff H. That sort of money seems great value!